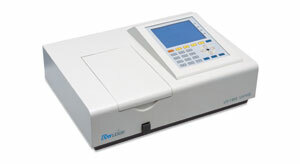 * It is a scan type spectrophotometer. * Three options for spectral bandwidth selection: 5nm, 2nm and 1nm, made according to customer&apos;s need, which can satisfy the requirements of pharmacopoeia. * Manual 4-cell holder accommodates width pathlength cells. * Optimized optics and electronic system design with over 30-year experience ensures high performance and reliability. * Rich measurement methods are adopted: Wavelength scan, time scan, multi-wavelength determination, etc., thus to meet different measurement requirement. * The measured data can be printed out. RS-232 interface is available for connecting computer. Parameter and standard curve can be saved.